Here comes the Vishu. Happy New Year! Vishu Aashamsakal!! I hope everyone had a wonderful time with loved ones and friends and enjoyed great food! 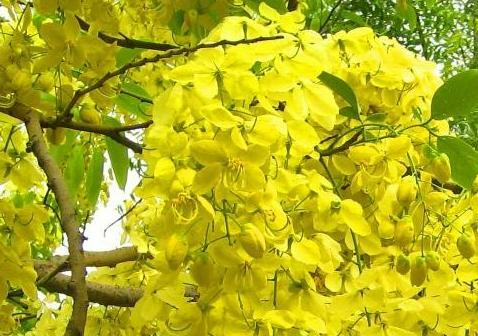 Vishu, the Malayalam New year which is celebrated in Kerala on the first day of the Malayalam month of Medam and the Tamizh Puthandu or Tamil New year, which is celebrated on the dawn of the new month of Chitrai in Tamil nadu. Vishu symbolizes the fact that you need to start right and will have the whole year right. What we see on the first day of the year has to be auspicious, signify abundance and good fortune. Thus the custom of opening one’s eye to Vishukkani, which is seen first in the morning of Vishu. Kani should signify the auspiciousness through the yellow colour and hence viewed with just the Vilaku / Diya’s. Vishukkani spells out abudance, both spiritually and materially. Food, good fortune, knowledge and light accompany us at all times and throughout the year. Vishukkani is basically a display of fruits, vegetables, flowers like jasmine, sunflowers, broken coconuts, rice, a new piece of cloth, coins, money and gold ornaments and kanikonna flowers (kanikkonna poo – which blooms just before and during Vishu) in front of the Lord Krishna idol or picture. And a mirror is kept in the display and the custom goes that, one has to see the display and then see their own face in the mirror. The mirror when seen on the morning of Vishu signifies Devi, and also the reflection of the things in front of the mirror shows that these would be multiplied by Her Grace. 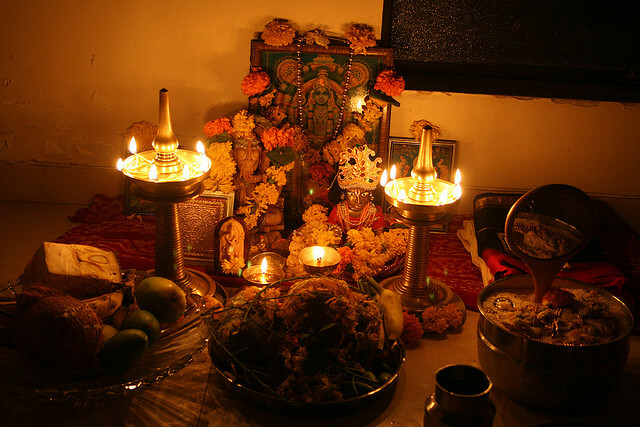 Usually Vishukkani is kept in one’s Pooja room just the night before the Vishu by elders, once the children and youngsters go to sleep. So that the next day, during the wee hours of the morning Vishukkani is viewed by the children and youngsters of the house. I remember being woken up early in the morning by my parents to see the Vishukkani. My mom and dad will close mine and my sister’s eyes, and bring us to the Pooja room. The significance is to look at such goodness, which will in turn make our lives with such goodness and bounty. As we open our eyes to drink in the beauty of the lamps, the fragrance of the jasmine, the jack fruit and the incense all in one, the sight we behold is as beautiful every year as if we see it for the first time. The reflection in the mirror only adds to the beauty of the grandeur already resplendent in all its glory. We would see the lemons, the coconuts, the coins, the gold and then finally prostrate to the Lord. Then followed by bath in the morning, it is customary to take the blessings and Kaineetam from the elders of the family. Later we have our breakfast in the form of Vishu Kanji and then go for bursting of crackers. Then follows a sumptuous and elaborate feast called Vishu sadhya in the noon. Just ahead of the Vishu, the households are a beehive of activity, that is cleaning the households, buying new clothes, fruits, vegetables and making feasts. Jack fruit or Chakka is one of the main items for Vishukkani. So there will be Chakka Varatti, Chakka Varuthathu, Chakka Pradhaman or Chakka Payasam, and also other eatables like Neyappam, Chakka Puzhukku, Cherupayar Puzhukku, etc. For breakfast there will be Vishi Kanji which is unique in Palakkad region and Vishu Khatta in Central Kerala. Elaborate menu has Ela Ada, Ottada, Aval Nanachathu, Aval Varattiyathu, Vishu Kanji or Vishu Khatta for breakfast. For lunch there will be rice, a host of side dishes and mains, pickles, chips or Pappadam, thorans, pachadi’s, kootans, erissery’s, pulissery’s and finally the payasams or pradhamans. It is this advantage of sharing our thoughts, ideas, interesting anecdotes, eating patterns and thereby getting to know different people and cultures makes it all the more interesting! I thought you might be busy. Its alright Jayeeta. Hope you and your family enjoyed the Easter vacation trip. Ya, even i like those traditional sarees a lot 🙂 Thats so nice to know that you have Malayali friends there. Do visit Kerala when you and your husband get time. And yes, you have a malayali friend here 🙂 Sure, we will meet up when you come here 🙂 I have a long time interest to visit Kolkatta during Durga Pooja celebrations. Will come there once when i get time with my family.